Despite rumours that new developments are flying off the shelf the numbers seem to paint a different picture. A recent report from Real Estate Weekly also shows new home sales are slowing similar to the resale market. It seems developers are being very cautious and holding off on starting new projects. Do the developers know something we don’t? 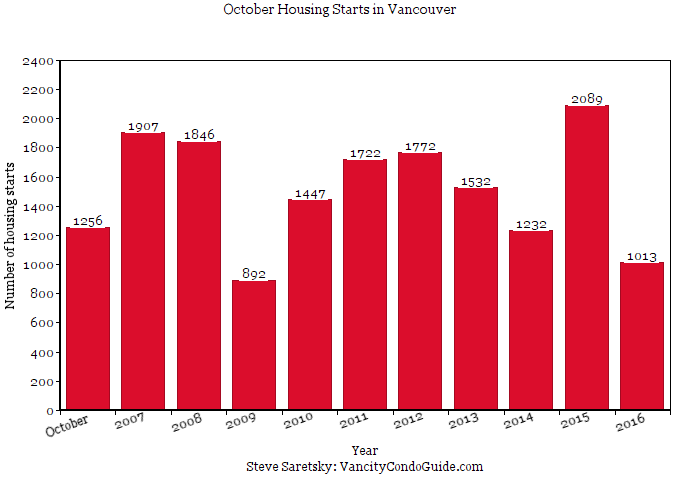 For the month of October Vancouver building permits were down 21.7% year over year. But more importantly, new home starts dropped 52%. Perhaps even more startling was that new home starts were 35% below the 10 year average for October. The slowdown doesn’t stop with Vancouver. Residential construction across BC plummeted. New home starts dropped 25% year over year. Yet permits were only down 1.6%. Does this imply that despite projects being given the green light developers are choosing a wait and see approach? The writing is on the wall. New construction sales are plummeting along with new construction starts. 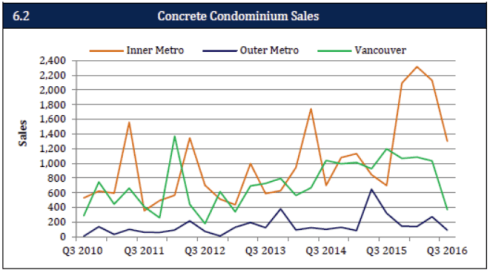 Recent stats from Urban Development Institute show concrete condo sales are down 21% year over year, while wood frame condo sales are down 44%. New townhouse sales also sunk by 28%. Buyers appear hesitant to lock in expensive pre sale prices with the uncertain future surrounding Vancouver real estate. To add to that, pre sale buyers would have to get re-approved for a mortgage when their new home completes a year or two down the road. Likely meaning higher mortgage rates than what they see today. As I mentioned in my post The Canadian Economy’s Unhealthy Addiction to Real Estate, residential real estate construction makes up 7% of the entire Canadian GDP, higher than the United States back in 2007. A continued slow down in new construction will affect more than just jobs.